Julie Brown receives commemorative award celebrating 1,000 career Lady Eagle points. Game cancellations due to extreme weather conditions, resulted in Saturday’s scheduled game with Cleveland being moved to Wednesday, February 5th. RCHS used Saturday as an opportunity to make-up a Dist 6-AAA match-up with Stone Memorial Lady Panthers which was cancelled earlier this week. The game began with a presentation to Senior Lady Eagle “Downtown” Julie Brown for joining the 1,000 Point Club in career points for the Lady Eagles. Congratulations Julie!! The Lady Eagles wasted no time getting back on track after a tough loss the previous night to Cumberland County. Lady Eagle Jessee Wallis posted 6 points in the first quarter, while Megan Revis posted 5 including a key 3 pointer. The combined effort allowed the Lady Eagles to close the 1st quarter with a 17-8 advantage. 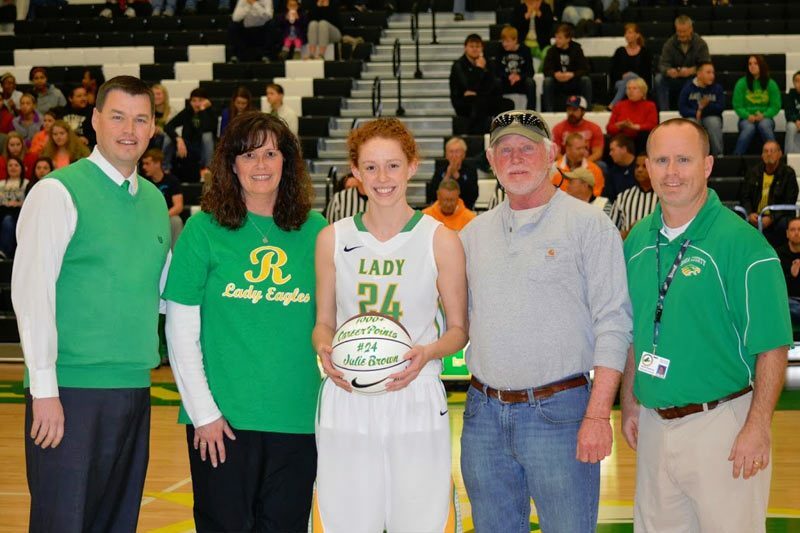 Wallis continued the Lady Eagles rally into the 2nd quarter scoring 10 of Rhea County’s 14 points. The tenacious Lady Eagle defense was relentless holding the Lady Panthers to 8 points in each of the first two quarters. The effort allowed the Lady Eagles to take a 31-16 lead to the locker room at the half. During halftime, former Lady Eagle’s Coach Steffan Holder and former players were honored for their accomplishments. The teams advanced into TSSAA Sub-State play in the state tournament. Christy Derlak Akin, Christy Norton Hurst, Heidi White, JoJo Marsh Brown, and many other notable players received standing ovations from the Eagle Nation crowd. As play resumed, the Lady Eagles picked up where they left off in the first half. This time it was Amber Levi who took control of the 3rd quarter with 13 points – including three key 3 pointers. The Lady Panthers tried and tried to rally, but Levi dashed their hopes with an amazing offensive performance. The Lady Eagles used their heads and the clock to go on to a 57-40 victory over the Lady Panthers. Game photos by Gary Bolden.